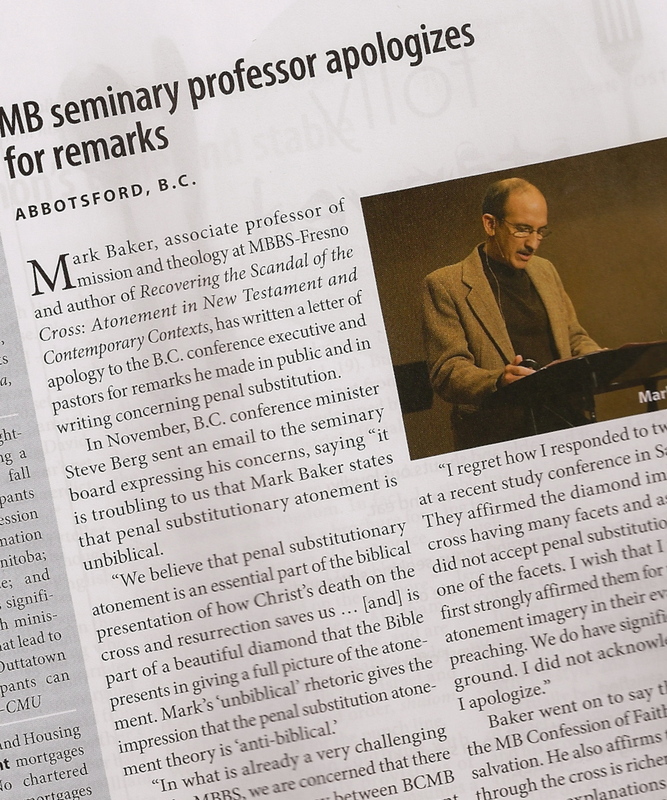 The article describes and quotes Baker’s response to the B.C. executive and pastors. Baker sounds gracious and thorough in explaining what he believes and what he wishes he’d communicated more clearly, what he wishes he had not written. The content of it sounds very much like what he stated at the MB study conference in Saskatoon in October — the same affirmations, clarifications, attempts at nuance — though he goes further to address a number of his responses at the conference itself. At that event, he stated his first book will be revised. He also clearly affirmed the MB Confession of Faith, Article 5 on Salvation, and does so again in his letter. I attended and reported — here — on the Saskatoon conference. I don’t recall “‘unbiblical’ rhetoric.” I do know that Baker felt himself rather on the block, so to speak, which is never an easy place to be, and I do recollect that he responded carefully and with integrity to the challenges raised to him. My opinion on whether an apology is necessary is beside the point, however. He made it, and it needs to be received. But, will it be received? Has it been? Maybe that’s what’s bothering me about this article. It’s not what’s here, but the pieces we’re missing. The back story. And what happened next. Re. the back story, I’m wondering why Berg sent this email to the seminary board after the October conference, when Baker’s views had been clearly indicated there. Berg himself led the session in which Baker presented. Is there other pressure coming to the B.C. executive? From the two people Baker says he wishes he had responded to more affirmingly? From those who did not attend? What’s going on? Berg notes an accelerating debate, but it’s hard to believe that Baker is responsible. And, to be honest, I’m queasy, fearing he’s being made the fall person. The letter has now been reported. But is there more we should know? And will there be other, good, responses to come? This entry was posted in Church, Mennnonite Brethren and tagged atonement, Lynn Jost, Mark Baker, MB Biblical Seminary, penal substitution, Steve Berg by doradueck. Bookmark the permalink. Thanks for your perspective on the situation, Dora. I agree, at times it’s hard to see where relational unity (personal and corporate) fits into the process you’ve described. I also think it’s good to hear the perspectives of other parts of our Canadian MB family, as you’ve done. So, thanks! Thanks David. My perspective at this point is a lot of questions — but of course I did also move into some “editorializing” on my “sense” of things in my post. I’ll definitely admit that! Your mention of unity is interesting. I think Canadian MBs have been quite desperate to keep it and that’s understandable. But sometimes we work at it publicly in odd ways — either keeping the lid tightly on the bubbling pot, or letting the steam escape on only one side. I thought we walked out of that open discussion session in Saskatoon more united actually, precisely because difference was spoken, diversity acknowledged, and yet solid, underlying agreement recognized. It’s counter-intuitive. It is an exasperating story- but probably what we need to keep figuring out as a family. There was a very informative discussion [IMHO] around this on the MB Forum which resulted in an interesting clarification of the process by Lynn Jost. This was the most important part of the discussion and ended up in the no-zone of the Forum. The MB atonement debate is still a tangled web but one with opportunity, I believe. Thanks James. I appreciate your link to Lynn Jost’s remarks at the Forum — I thought I’d made the link above but seem to have made an error. The conversation that led up to that at the Forum was useful too; whoever you all were, I was grateful for the insistence of many on caution when making judgements of others. The BC Conf got a pretty big push-back from a lot of pastors who had attended the Saskatoon Study Session. There were a lot of people- including myself who wrote responses expressing displeasure. It is hard, even for a person like myself, who is quite connected to get a sense of scale but my sense is that Steve Berg was speaking from a minority position. It’s tough to know, however if we don’t talk about things like this formally. And that’s the rub IMO.